Small deviations in SST anomaly are visible just after El Chichon that mark a cooler summer but with no discernible long term offset. Following Mt Pinatubo eruption, there is reduction in the amplitude of annual cycle that produces a negative residual in the anomaly series at NH extra-tropical latitudes. This could well be caused by the increased optical depth of the atmosphere reducing the diurnal and season extremes. This is superimposed upon temporary dip that lasts unit about 1995, though a downward trend is notable before the eruption so this is likely to be a natural variation. 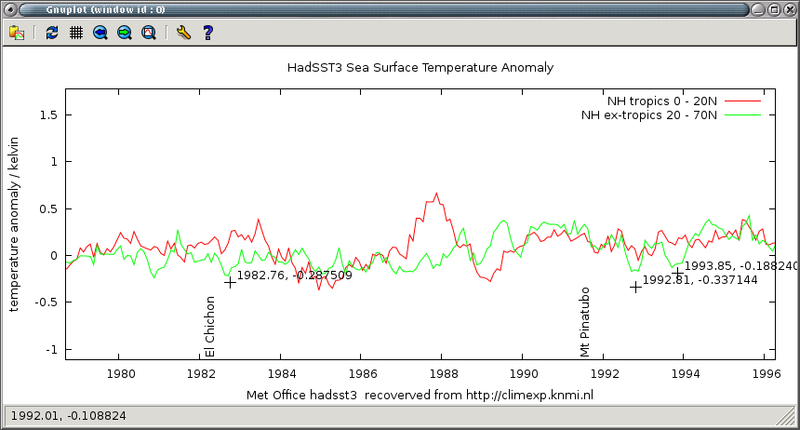 Lesser similar annual residuals are seen in tropical SST for two years, with not dip. Again no, long term impact.